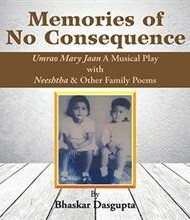 Memories of No Consequence by Bhaskar Dasgupta is half musical play and half poetry, with one short personal essay between the two sections. The book begins with the play Umrao Mary Jaan, based on the 1899 Urdu novel by Mohammad Hadi Mirza. The tragic melodrama concerns Mary Jane, a Victorian lady, and Umrao Jaan, a courtesan in the court of Lucknow. An older woman talking to her granddaughter, Mary Jane recalls the beautiful, infamous Umrao Jaan, who, after being kidnapped and sold into courtesanship, seeks a peaceful life —but is thwarted by jealous suitors, murder, and political intrigue. The dialogue is lively and full of emotion, and while typos are distracting, the story is adventurous and compelling. In addition to being optimistic odes to family members, the poems offer the positive life reflections of an older man: “So what have I learnt – from my long life? / That my patients are right – and so is my wife!” Thick with exuberance, the work shows appreciation for things such as a “magical vista of unseen beauty.” While not particularly fresh in their language usage, the poems effectively communicate the concerns of an individual who embraces the joys of culture and family. The essay, “The House without Walls,” is a glowing ode to Dasgupta’s original family home in Jamshedpur. It delivers engaging local, homey, sensory detail, although too often depends on the passive voice. Overall, readers will find a mix of approaches and varying degrees of success in this material, which will appeal to those who appreciate variety, as well as anyone interested in Indian and Indian American family culture.